Winter is a season that is often overlooked when choosing trees for a landscape. The following are five suggestions for trees that add interest when the snow begins to fall. "Wherever there are grey birches, Nature is in one of her lightest moods. These grey-white trees of slender form gather together on fairy-like groves. Their slim grace is accentuated by the way they often spring up in fives and sixes from a single root. When they are young they are grey-brown, but later on they are phantom white with black twigs and black notches. The effect is full of that mystery that etchings and and delicate pencil drawings have. The gossamer quality is ever present; in the spring when their filmy foliage is light filled, in summer when their green is soft, in autumn when it is all sunlit yellow, and even in winter when the trees take on again their keynote colors from the snow and dark earth." **Even in the jewel box size, Brooklyn brownstone garden designs I build, this tree never fails to capture viewers emotions! Rhus typhina / Staghorn Sumac. A deciduous shrub or small tree that typically grows in colonies and has great architectural structure. After an incredible display of color in the fall, the fruit appear on branches like flames on a candelabra. This fruit remains persistent throughout much of winter. Acer griseum / Paperbark Maple. What makes this tree so special is it's cinnamon colored exfoliating bark. With the sun low in the sky during winter the tree is easily backlit, taking advantage of their silhouette and the transluscence of the exfoliating bark in a garden design is crucial. Ilex opaca / American Holly. This is the only native holly with spiny-tooth evergreen leaves. In a New York City landscape design I find it works well in the urban garden where buildings block the strong winter winds that can cause it to burn. Tsuga canadensis / Eastern Hemlock. There are weeping cultivars, columnar cultivars, dwarf cultivars and globular cultivars. Even in it's natural form where it will grow quite large, it still maintains a softness and elegance due to it's branching habit, needle form and dainty, hanging cones. Acer Palmatum Sango Kaku / Coral Bark Japanese Maple. If you love red...four season interest in this tree. 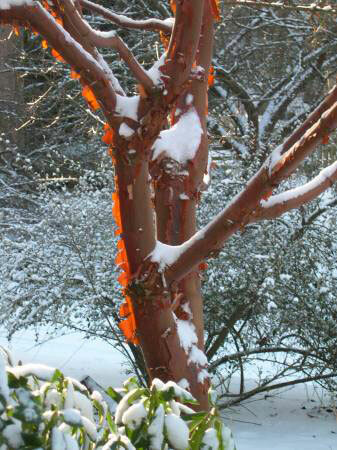 Especially in wintertime when the stems appear to glow against a blanket of snow. If you enjoyed this post, please share this post. Thank you!